First municipally owned forest in California. Used for education, recreation, wildlife habitat, and timber harvest. 2nd growth redwoods. 144 bird species. 2nd growth redwoods near Crescent City. Campground and picnic area with volleyball, tether ball and swings. Old-growth near the headwaters of South Fork Elk River and Salmon Creek. Northern spotted owls, marbled murrelets, coho salmon. Ocean views, agate beach, whale-watching, lush forest, native plant garden, re-created Native American seasonal village. Part of Redwood National and State Parks. Ancient redwoods in Tall Trees Grove, Ladybird Johnson Grove. Swimming, kayaking, seasonal trout and salmon fishing on Smith River. Riverside camping and picnicking. Close to a golf course. Remote forest at southern border of Sinkyone Wilderness State Park. Ancient candelabra-shaped redwoods. Access limited to trail. Redwoods, fishing, camping, swimming, picnicking. Park has 2 parts: Swimmers Delight and reservation-only group campground, Pamplin Grove. Fishing. Beautiful grove along South Fork of the Eel River. Classic “cathedral” experience associated with stands of old-growth redwoods. Picnic area, 60-foot-waterfall, swimming and fishing opportunities in the Eel are complementary attractions. Summer swimming and picnicking along the South Fork of the Eel River. Winter salmon, steelhead fishing. Hike to old mill site. Ancient redwood grove with access to Redwood Creek. Del Norte Coast Redwoods State Park lies right on the Pacific Coast, just south of Crescent City, California. It offers 8 miles of rugged coastline, a mixed forest of Sitka spruce, Douglas-fir, red alder, and some fine old-growth redwoods. Part of a string of lagoons between Eureka, California, and the Oregon border, Humboldt Lagoons State Park includes Big Lagoon Beach, Dry Lagoon (which is actually a marsh) and portions of Stone Lagoon. Nestled farther inland than most of California’s coast redwood forests, Grizzly Creek is home to spectacular ancient groves. Today Humboldt Redwoods State Park covers about 53,000 acres-including 17,000-acre Rockefeller Forest, which is the largest continuous stretch of old-growth redwoods in the world. 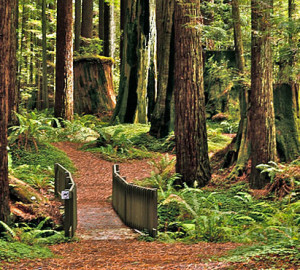 Save the Redwoods League has protected more than 50,000 acres in this park. 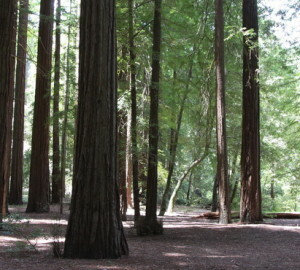 7,500-acre Sinkyone Wilderness State Park features twisted and windswept redwoods ranging from 1 to 10 feet in diameter. Some head to Standish Hickey to hike in its towering redwood forest; others come to leap into a sun-drenched swimming hole in the Wild and Scenic Eel River; still others arrive to relax and recharge in the historic Redwood Campground.